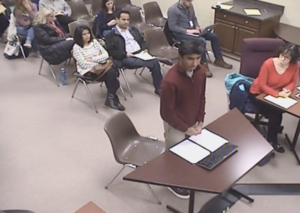 Ridgefield High School freshman class president and student representative to the New England Association of Schools and Colleges' School Culture and Leadership program, Anshuman Suryawanshi, recently took advantage of the public commentary at Ridgefield Board of Education meetings to share the negative effects of cutting a year of Global History from the graduation requirements at RHS. He discussed the implications such a cut would have on minority students, saying "Global I is special because it focuses on other cultures and focuses on non-European history. This resonates with me personally because global is the one class where students are required to learn about Indian culture. This course has taught me at least as much, if not more, about Indian history than by being an Indian American myself... Shaving down two years worth of Global History into one year will dilute the quality of education across the board, . . .but more specifically, will harm the educational experiences of minority students like myself by not giving other students the chance to learn about our cultures." Suryawanshi also addressed the mission statement of the Ridgefield Public School district, highlighting the goal of creating "global citizens," postulating it would be hard to claim students were global citizens if they did not have a solid grasp of global history, before closing by addressing recent cuts in non-western curriculum in the AP World History course offered by the College Board.